Choose from a selection of 12 holiday rentals in Iznájar. Use the search form to the left to filter the results and pick your choice of self catering accommodation in Iznájar. We have a good selection of holiday apartments in Iznájar perfect for family, single, romantic and group holidays. You may prefer to take a look at our listed holiday villas in Iznájar or holiday apartments in Iznájar. Find your holiday homes by a specific type using the property type drop down in the filter. Filter the holiday homes in Iznájar by a specific area using the area list above. This well-maintained farm house with its beautiful, old facade in Iznájar is decorated in pleasant rustic style and offers very good comfort. This recently built house at the reservoir of Iznájar has been furnished with new quality furniture. Spend a wonderful holiday in this finca, surrounded by olive groves and enjoy good times with your loved ones. Set in an olive grove, this renovated house with pool offers a unique view of the valley. This aesthetic, terrace house furnished with all comforts is located in the heart of Andalusia. During the winter months, the fireplace ensures cosy warmth inside. This authentic two storey home is situated in the historical village of Iznajar. The village is found on the southerly border of the Cordoba provence, within Andalucia. 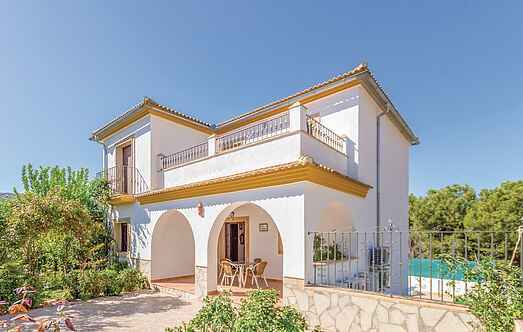 Have you ever wanted to feel like a big Spanish landowner and reside in a privileged location? In order to fulfil this dream, you do not need to be a millionaire to live like one. This beautiful holiday home was originally an Andalusian farmhouse converted into a villa. The elevated position makes it an ideal place to admire the nature from a bird's eye view. This charming villa is located on a 2,500 square metre plot, surrounded by expansive picturesque olive groves and an impressive mountainous backdrop. El Cortijo Las Olivas is situated in "the three Provinces" area of Iznájar where Granada, Malaga and Córdoba meet, offering holiday accommodation in a tranquil rural setting, only 3km from the beautiful white mountainside village of Iznájar overlooking the spectacular Iznájar lakes.